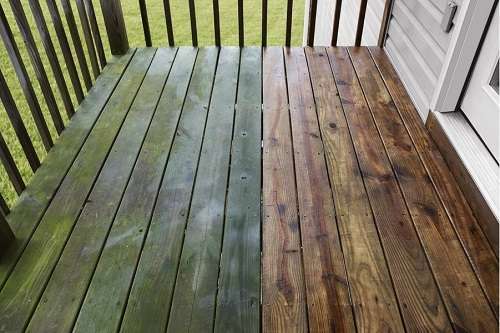 Do you frequently wonder how to get rid of dirt and debris from your driveway or garage? Using a garden hose isn’t a suitable option. For one, it is not ergonomically friendly, and sooner or later you will develop aches and pains. Plus, you end up wasting a lot of water when using an average garden hose for cleaning your patio, deck, or even your car. The flow of water is steady but the pressure is nothing to write home about. If you are facing this situation, the ideal solution for you is to invest in a top of the line gas powered pressure washer. While there is no dearth of gas pressure washers on the market, one name does stand out: the PowerStroke PS80931. 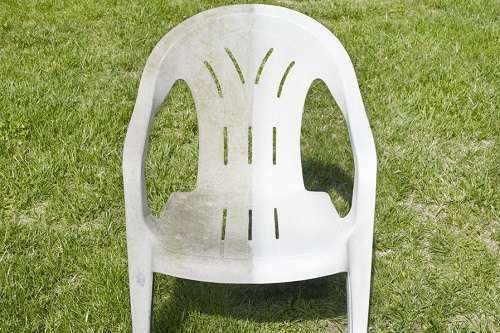 The pressure washer has been designed to make keeping your home exterior spick and span easy. If you are constantly fussing about your home’s curb appeal and appearance, this pressure washer will prove to be a handy purchase. Certified by the PWMA and easy to assemble, this is the perfect product to buy if you want to handle cleaning tasks on your own rather than calling in professionals every time your rain gutter gets clogged. Powerful Engine - The PS80931 features a strong Briggs and Stratton engine that generates power up to 191 cc. 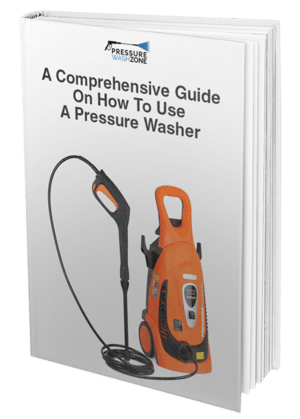 This is sufficient to enable the washer to deliver a water pressure of 3100 PSI, which is among the top range in the market. The pressure is strong enough to help you clean any surface, regardless of whether it is covered in dust, debris, mold, or grime. Just direct the hose towards the surface and it will be clean in no time. 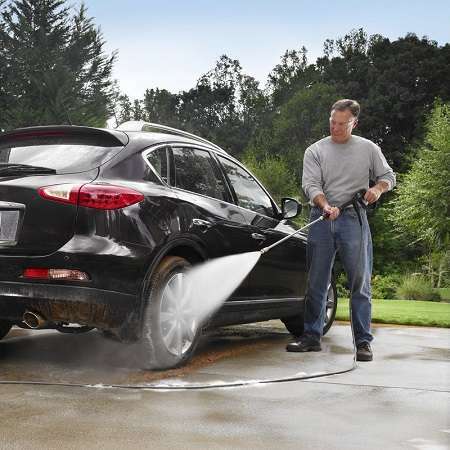 25-Foot Hose - This pressure washer comes complete with a high-pressure 25-foot hose. The best part is that the hose is non-marring, which ensures you can use it anywhere you want. Whether you want to wash your car in the garage or wash the roof of your home, this hose will deliver the pressure you are looking for without you having to bear any additional strain. Aluminum Pump - A standout feature of this pressure washer is its aluminum pump. The best part about the pump is that it requires zero maintenance. Yes, that’s right. You can continue using the washer without hassle and not even have to think about cleaning the pump. The solidity of aluminum ensures the pressure washer continues to deliver reliable performance for a long time to come. Multiple Nozzles - Like all the leading gas powered pressure washers on the market, the PS80931 also features multiple nozzles. You get a long range and a short range nozzle along with a nozzle for soap. This means you can easily adjust the flow of water and angle to suit your needs. If you want to use soap, you simply have to attach the soap nozzle and you are good to go. 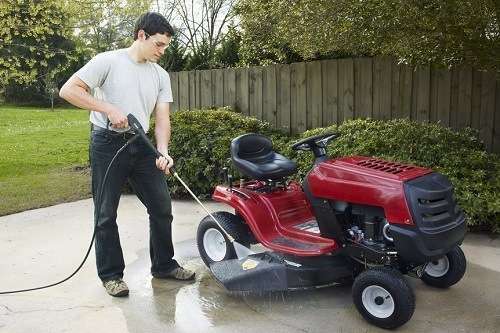 Sturdy Wheels - The pressure washer features 12-inch, flat free wheels. This means you can easily maneuver the washer and take it anywhere you want, regardless of the terrain. A common complaint people have with gas powered washers is that they are heavy and difficult to move around, but that issue is addressed perfectly in the PowerStroke PS80931. 2-Year Warranty - Given that the product is made in the US, you should have peace of mind that there are no cheap parts or compromises on quality. However, PowerStroke has gone a step further and offered a 2-year warranty on this pressure washer. This means, essentially, you are making a risk-free purchase if you opt for this washer. On-Board Storage - All the detachable parts of the pressure washer can be stored within the washer itself. This means you don’t have to worry about losing the nozzle, hose, and other components. This product has received an average rating of 4 stars out of 5 on Amazon. 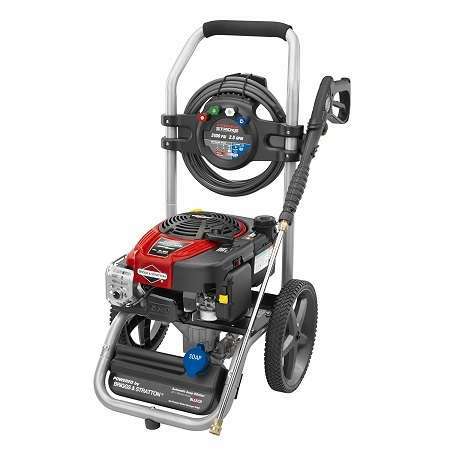 The rating is decent, but this product has received a large percentage of negative reviews, which is rare in the case of gas powered pressure washers. The most common complaint people had with this product is that it arrived in a bad shape. Either the soap tank was damaged or the entire unit was malfunctioning. So, you can say that the negative reviews are more because of a lack of quality control rather than a lack of quality. This is because there are many positive reviews as well. A customer was ecstatic about the ease with which the pressure washer starts. You don’t have to keep pulling and pulling before the motor comes on. A couple of tugs and you are good to go. Several customers have stated that the PS80931 performs just as well as a Honda powered pressure washer, which is a huge compliment. A customer stated that the pressure is easy to set up and you can start using it within minutes of receiving the package. A customer praised the washer, stating that the pressure it offers is amazing, but also wrote that it could do with a longer hose. Again, this is a minor gripe. You can purchase this pressure washer on Amazon for under $265. This means you enjoy a discount of around 40% and get free shipping if you have signed up for Amazon Prime. Keep in mind that this price is for the model that comes with the Briggs and Stratton Engine. The same machine is available in other engine options on Amazon as well. You can still look for deals and discounts to save a few bucks, but you are unlikely to find a 40% discount elsewhere. All in all, it is hard to find much fault with the PowerStroke PS80931. However, it does appear you have to be lucky to receive the pressure washer in mint condition in the package. That being said, it is definitely worth purchasing, plus Amazon is offering an amazing discount on it.